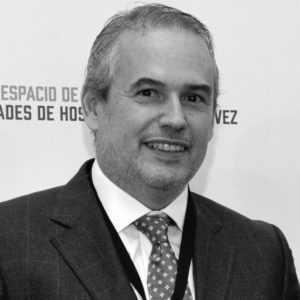 José Martínez-Raga is currently the Head of the Psychiatry Department at the University Hospital Doctor Peset, one of the major teaching hospitals in Valencia. He also works as a lecturer at the University of Valencia Medical School. Dr José Martínez-Raga received his Medical Degree (Licenciado en Medicina y Cirugía) from the University of Valencia Medical School, going on to complete an M.Sc. Degree in Drug Addiction. Later, he completed a Ph.D., having conducted a study as a Research Fellow in Psychiatry at McLean Hospital and Harvard Medical School (Massachussets, USA). He completed his specialist psychiatric training at the Maudsley and Bethlem Hospitals in London (1996–2000). Since then, he has returned to Spain, and has been working as a psychiatrist within the Spanish National Health Service. Until 2012, he was the coordinator of an outpatient Addiction Behaviours Unit before obtaining his current position. Dr José Martínez-Raga has co-authored over 100 peer-reviewed national and international scientific journals, as well as over 40 book chapters and 12 books and monographs. In addition, he has been invited to present at more than 75 presentations and at national and international, psychiatry and addiction conferences and meetings. Currently, he is also Vice-President of the Sociedad Española de Patología Dual (Spanish Society of Dual Disorders or SEPD). Received honoraria or consultation fees from Shire. Participated in Shire, Lundbeck and Janssen sponsored speaker’s bureau.